Shadow Home Secretary made a crucial point, albeit that Sir Gerald Kaufman didn't accept it. "Since the passage of the Official Secrets Act 1989, the leaking of material not concerning national security has ceased to be a criminal offence. On what basis, therefore, is a civil servant arrested for that, and on what conceivable basis is my hon. Friend the Member for Ashford (Damian Green) arrested? If the right hon. Gentleman starts by asking himself that question—which relates to a gift to civil liberty from the last Conservative Government—he will start to conclude very quickly that the basis for the police’s erupting into this place and searching a Member of Parliament’s offices is shaky in the extreme. That is why he should be very concerned about what has happened, particularly because all the normal processes and protections that should have operated—including the consulting of the Director of Public Prosecutions—never occurred. Sir Gerald Kaufman: What puzzles me, in view of that bout of rodomontade from the hon. and learned Gentleman, is why he says that Christopher Galley should be sacked, because Christopher Galley appears to have been doing something which is hugely praiseworthy." I particularly want to draw the House’s attention to that last phrase. So far as I am aware, it has never been a criminal offence to impede the efficient and effective conduct of government and nor should it be. I do not think that the police should have been called into investigate on that basis, and they should not have agreed to do so. I have written to Mr. Ian Johnston, the chief constable of the British Transport police who is carrying out an inquiry into the police’s handling of the matter, and asked him to consider this point in his inquiry. I have written to the Minister in charge at the Cabinet Office to ask who in the Cabinet Office called in the police on that extraordinary basis and whether the Minister authorised or knew of that action." The Government has just defeated an attempt by a cross-party group of MPs to widen the remit of the committee investigating the circumstances of the arrest of Conservative MP Damian Green and the search of his office by a mere four votes. The amendment - moved by Sir Menzies Campbell - was also signed by a plethora of seniors MPs from different parties, including Conservatives David Davis, Michael Howard and Kenneth Clarke. Defeated by 285 votes to 281, it would have allowed for the committee to get on with its deliberations immediately and not necessarily have a government majority. The main motion setting up the committee was then passed by 293 votes to 270. Theresa May has just told the Commons that she and David Cameron were recommending that Conservative MPs do not sit on the committee because it "blatantly flies in the face" of the desire the Speaker outlined last week as to its nature. Simon Hughes said that the Liberal Democrats took the same view. "The motion before us today flies in the face of the Speaker's statement. It is not only a gross discourtesy to the Speaker, but a flagrant abuse of the power of the executive, a blatant attempt to pack the committee, and delay its work until the controversy is over. This Parliament deserves better from its Leader. "The Leader should be in no doubt that if a committee is set up with a government majority that it would not have the support of the opposition." "The police will not think worse of the Home Secretary to ask awkward questions like 'have you applied for a warrant?' That is not improper interference. It is the proper exercise of scrutiny for ensuring that the police are doing their job. "If this Committee is stuffed with Government Officials, we will treat this committee with the same contempt that this Government has shown to the House." "I do realise how annoying leaks are. They're not always heroic. "I don't think that anybody here is in favour of a totalitarian government. No one on this side is running spies in the government and no one on the front bench is advocating a police state. I think we have a House of Commons that is committed to parliamentary democracy. "We are led in an increasing air of carelessness and indifference. We don't all respect the rule of law." Other robust contributions were made by Michael Howard, Iain Duncan Smith and David Davis. 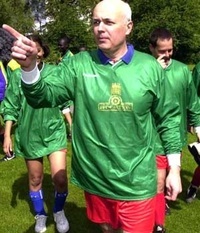 Highlights of Iain Duncan Smith's speech at a Westminster Hall Debate he initiated on overseas footballers in British football. "I asked for this debate not to demand that politicians and the Government get directly involved in running UK football, or any sport for that matter, but because, like many hon. Members, I take an interest in football. I care that the national games of England, Scotland and the other home countries are in good health, and when they are not, I want to ask key questions and initiate a debate." Young British players with potential appear to be discarded too early: "The first issue that I want to address is the effect of training on the development of new, young English players coming through to the top sides. The balance of overseas players in the premiership seems to be out of kilter with almost everybody else. On training, the premiership declares: “Young players must fight for first team places against some of the best players in the world. Those who succeed can be confident that they have been tested against the best, and deserve their places on merit”. I worry about such statements, because they sometimes miss the point. Making youngsters from possibly every nation in the world compete at that age begins to limit the number of places available for young English national players. The different attitudes on training are interesting. Alfie Apps, the European scout for West Ham has said that, in England, our clubs have put money into training and demanded that players develop quickly. Many clubs discard players at a very early age if they do not think they are up to the job—18 is normally the limit. Many overseas coaches are concerned that, on the continent for the most part, they persist with the development of young players until they are 22. Ironically, that is often the age at which English clubs pick up overseas players, having discarded their own at an earlier age."